What they had to say at Healthline. 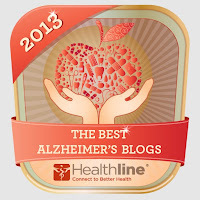 The Alzheimer’s Reading Room is a comprehensive site run by caregiver and advocate Bob DeMarco. A variety of talented writers offer everything you need to know about the challenge of caregiving, your loved one’s condition, and self-care. Thanks to the tireless efforts of everyone at the Alzheimer’s Reading Room, you have a go-to place for advice, education, and an occasional laugh. Stop by and start feeling empowered to handle life as a caregiver. There is no doubt in my mind that our life experience with Alzheimer's, the our meaning Dotty and me, was greatly improved by the Collective Brain of the Alzheimer's Reading Room. This includes every writer, contributer, those of you that take the time to comment and share your insight, and those of you around the world that prayed for us, and others, in our time of greatest need. There is no substitute for the love, care and support of an Alzheimer's caregiver.